There’s no getting around it. Rosamund Pike is an author’s dream. Whether she’s portraying the eldest sister in Jane Austen’s quintessential novel, playing the mentoring and stunning Helen in the adaptation of Lynn Barber’s memoir, or keeping us all on edge as Gillian Flynn’s perfect antihero, her versatility and commitment to the craft makes every moment on screen echo with the intimacy between a book and its reader. As Rosamund Pike’s birthday draws near, we’re diving into her literary roles – those we love and those we’re eager to fall in love with. Kiera Knightly might have been the main box office draw for the 2005 adaptation of Pride and Prejudice, but we couldn’t stop watching another Bennett sister. Rosamund Pike played Jane Austen in this gorgeous film full of stammering Darcy lines and sweeping English country sides. (It’s hands down the best Pride and Prejudice adaptation. Don’t @ us!) This movie introduced us to Rosamund’s grace and charm as well as her incredible acting. Her comfort in front of the camera makes us wonder if she’s lived there her entire life – smiling from the background of every film ever made. After filming Pride and Prejudice together, Carey Mulligan and Rosamund Pike were reunited in An Education, a film that should receive extra credit in the world of literary adaptations. Not only was the movie adapted from Lynn Barber’s memoir of the same name, the screenplay was written by novelist Nick Hornby. (He’d go on to adapt Cheryl Strayed’s Wild and Colm Toibin’s Brooklyn for the big screen, as well as the television mini-series Love, Nina, based on the book by Nina Stibbes.) In An Education, Rosamund Pike plays Helen, a mentoring and ultimately deceptive friend to Carey Mulligan’s Jenny. 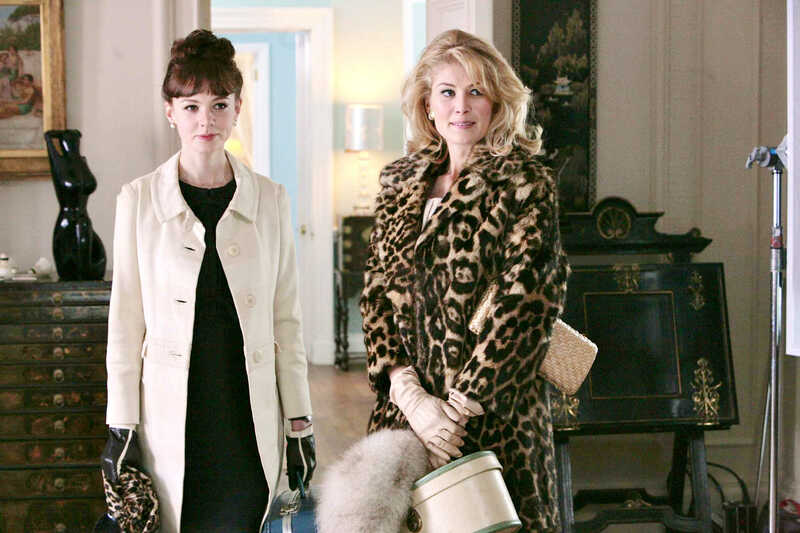 She seems perfectly at home in the 1960s dresses and coats Helen wears throughout the movie. She’s so stunning we almost forget to hate her. If Rosamund Pike is the queen of literary adaptations, Gone Girl is her coronation. She is incredible as Gillian Flynn’s complicated and utterly satisfying “cool girl” Amy Dunne. Even when she’s making destructive choices that destroy the lives of those around her, she is magnetic. It’s impossible to look away. Saying the tiniest bit too much about this movie would spoil everything, but let’s just say Rosamund’s performance is everything. We eagerly await a remake where Ben Affleck is replaced by Christopher Plummer or literally anyone else. As Rosamund Pike devotes and avid readers, we admit that there’s always room to grow. Here's another literary movie we’ll be watching on our next movie night – popcorn in one hand, notebook in the other. Rosamund Pike plays Hector’s wife Clara in Hector and the Search for Happiness, a film that (if the trailer is to be believed) involves a fair amount of Rosamund Pike looking radiant on the other end of a Skype call. The film is based on Francois Lelord’s novella of the same name. (Which we’re delighted to learn is part of a whole series titled Hector’s Journeys.) While we don’t like seeing Rosamund Pike playing second fiddle to anyone, even if it is Simon Pegg, we’re really looking forward to watching this sure to be heartwarming film.